Food & Recipes Archives - Baby Doodah! 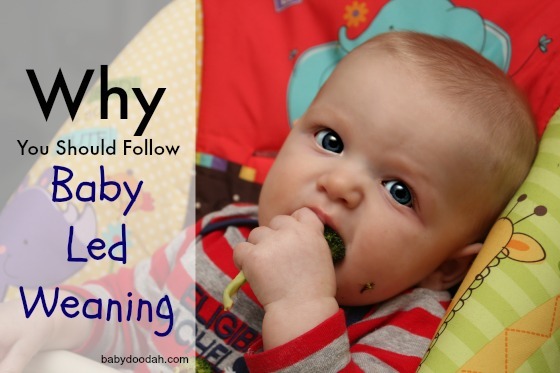 Are you thinking of doing following the Baby Led Weaning (BLW) eating method? 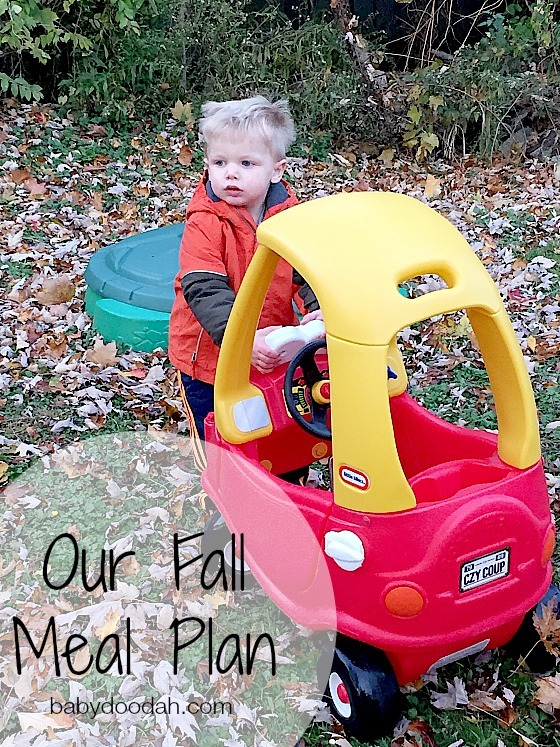 You might be a little worried or concerned about how everything works – Well, worry no more, I’m sharing all sorts of information in regards to why we did BLW with Emmett. This is the very FIRST time we gave Emmett solid foods. 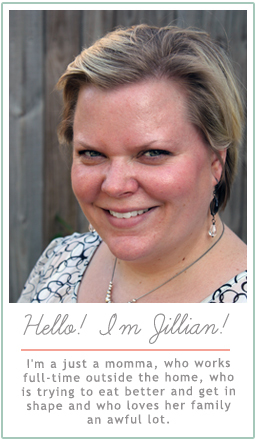 First, you may be wondering why we chose the BLW method in the first place, right? Or maybe you’re wondering how I came across this method? Well, similar to how you’re getting this information right now, I got it from one of my favorite blogs, The Art of Making a Baby. She used this method with her daughter and was seeing such success that I decided to read up on it. You can read my review of the Baby Led Weaning book here. I was hooked right from the start. One of the big things the method touts is that since your child is in charge of feeding themselves, they’re never forced to eat anything they don’t like nor will they eat too much. As I’ve mentioned on the blog before, I struggle with Binge Eating Disorder and emotional eating. I do not want Emmett to ever have to suffer through this, and wanted to take every precaution and in ensuring his eating health. Number one was to breastfeed him from birth, and now number two was to follow Baby Led Weaning. Another big important thing to note about BLW is that they recommend you start with veggies (not fruit or cereal), broccoli in particular. It allows your child’s pallet to develop to the less sweet foods (including fruit), that they then typically end up wanting more of. We did eventually get to bananas, apples and strawberries, but Emmett’s first foods was steamed broccoli, followed by steamed baby carrots and roasted sweet potatoes. I truly believe that BLW is one of the most effective ways to feed a child who is 6 months or older. They learn how to feed themselves right off the bat, rather than being spoon-fed (though, Emmett did use a spoon, but on his own). 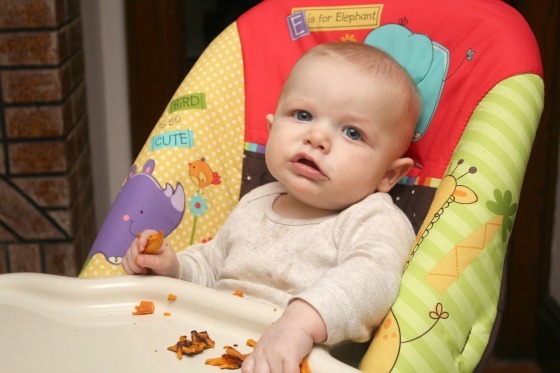 In the beginning, since babies love to put everything in their mouths, you just place the foods on the high chair tray in front of the baby, they naturally want to pick it up and mouth it. Since this is all about exploration, if you are feeding your 6 month old breastmilk or formula, them filling their belly with veggies is completely unnecessary. 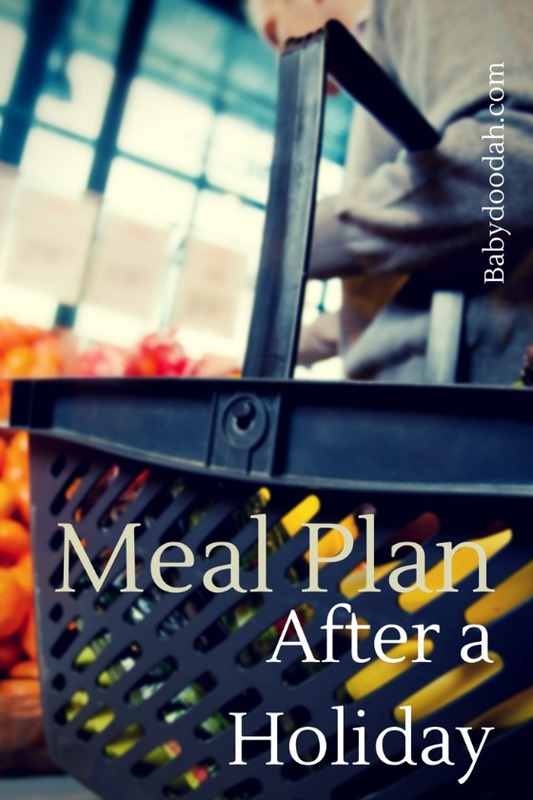 A couple of other things of note, it is super easy to prep food for your baby when following BLW. Baby eats what you eat! This can lead to a more experimental child when it comes to food choices, even as they grow. Children learn to feed themselves earlier, so they learn to stop eating when their bellies are full. You will still have a thriving, healthy baby if you don’t follow BLW – but by following it, you will find it MUCH easier to get your baby, turned toddler, turned 4 or 5 year old, to try new things. Emmett (now almost 2 1/2), may not eat or like everything we put in front of him, but 9 times out of 10, he will at least try it – and many times he’s learned that he likes it (cherry tomatoes is an example of this, for us). When I first came across BLW I was very skeptical. I always thought, how is a baby not going to choke(more to come on this aspect in a future post)!? I couldn’t have been further from the truth. Right off the bat, Emmett was successful with it. We started with broccoli and he ate it immediately, picking it up and putting it into his mouth. He gummed it a bit and probably got a few leaflets down, but he didn’t have even the slightest problem with the taste (and NO gagging!). 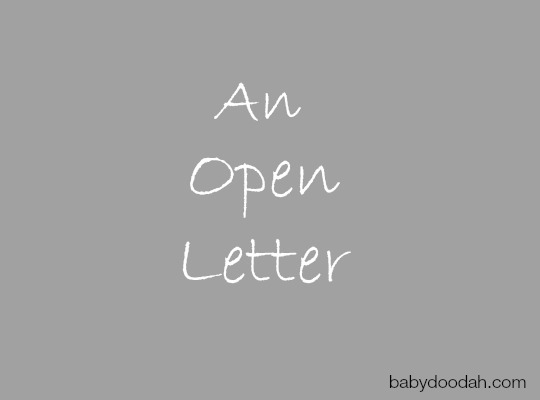 You should not begin using the BLW method until your baby is 6 months of age or older. The child’s stomach is just not ready for ANY food prior to that. It can cause stomach distress or an onset of allergies. On that note, remember your baby makes the decision on when he/she is ready to eat. You can offer them food, but if they’re not interested, that’s okay, because…. 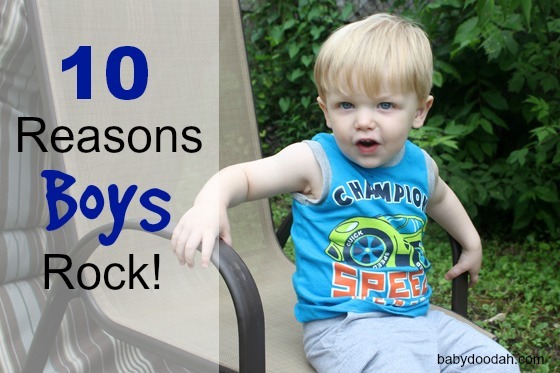 Until a baby is 9 months old, they don’t REALLY need solids. They should be getting most of their calories from breastmilk or formula. Naturally, by around 9 months, your little one will start to notice how the solid foods taste yummy and help keep their bellies full longer. You should always serve your child food in a high chair. You want them sitting upright and contained. Gagging is NOT choking, but a productive means that the baby uses to keep himself from choking (there’s a whole section in the book dedicated to this). Even though there will likely be gagging, there will probably be less than if the baby is spoon-fed, bc the child is in control of how much and the speed at which they eat. Most foods are not off limits. Since you don’t start BLW until the baby is at least 6 months, your child’s stomach is developed enough to handle any food. (You should avoid milk and PB if you have a family history of allergies). There’s no need to prepare for BLW. As long as you have a high chair, you’re ready. Make your 6 month old child some extra soft broccoli or maybe even sweet potatoes, place them in their high chair at the table with you and watch the magic happen. If you’re thinking of following this method, I highly recommend you read the book Baby Led Weaning by Gill Rapley and Tracey Murkett, it will answer any possible questions you may have about the process. I know there are tons and tons of forums and blog posts (like this one) that are helpful, but I think it is very important to read the book, as there are loads of tips, that are not included here. I personally read through the book twice, and then certain sections, 3 or 4 more times. I highlighted, tagged and wrote on many of the pages. I wanted to be well prepared and well-versed before we began the process (I read the book when he was 5’ish months old). And, I’ll be honest, the first few times Emmett gagged were kind of scary, but we were right there, watching his every move and, just like the book says, he gagged twice and the too large food was back in the front of him mouth. It is important to mention that gagging is NOT choking! Gagging is a defense mechanism and the baby’s gag reflex starts at about the center of their tongues, WAY before it reaches their throat, so babies are very good at protecting themselves. Trust me, I completely understand the nervousness that surrounds feeding your child this way – you’re worried that they’re going to get enough nourishment or maybe that they’ll choke. Just remember, your child will not start devouring food at 6 months they don’t need to, it is more for exploration, and getting familiar with feeding themselves. Around 9 months is when your child will begin actually eating with the intent to fill their bellies. Even, despite all my worries, I don’t regret feeding Emmett BLW style, and I honestly think it was one of the BEST decisions I ever made as a first time mommy. Now, he’s an adventurous eater and will try most things we put in front of him. Have you tried BLW? What was your experience like? 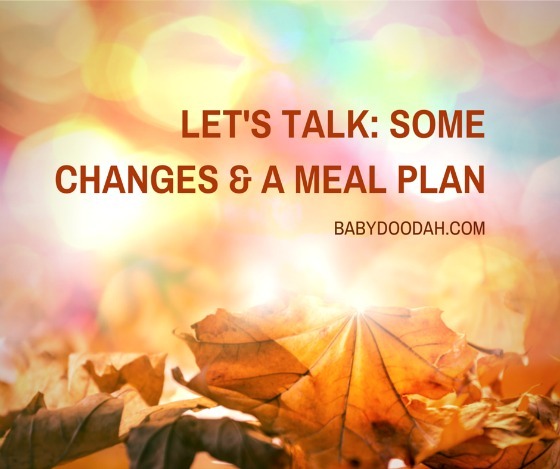 Have you thought about following the BLW method, but you’re nervous? What other information would be helpful to know? Who doesn’t love looking back at the last year? It reminds you of what you’ve done, where you’ve come from and reminds you of projects / ideas you had and still need work. 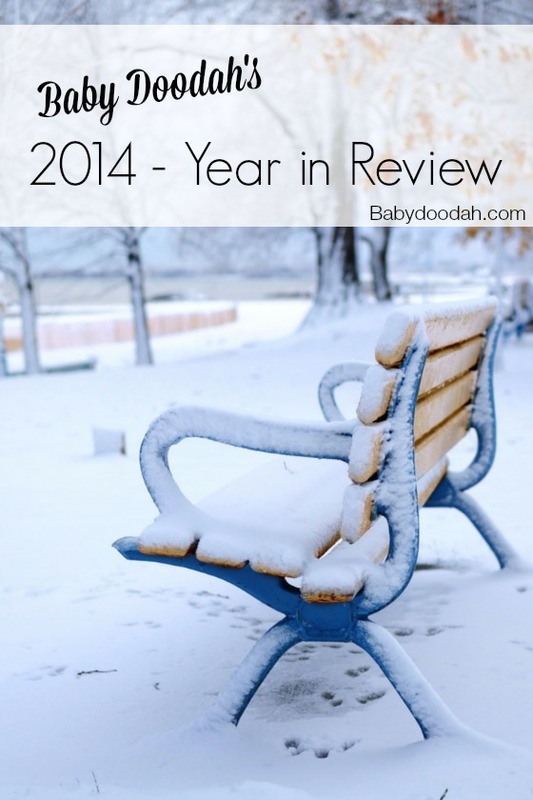 So, with that being said – here is Baby Doodah’s Year in Review! Right off the bat, I think my favorite post was An Open Letter to the Woman in the Car Next to Mine. Simply because it was some of my best writing on this blog, to date. I am proud of what I wrote in that post and I hope that it helps others understand the true struggle that Binge Eating Disorder creates. Does anyone else have two sets of resolutions? I have my business / professional goals and intentions and then I have my mom resolutons. In 2014 I decided that I would come clean to the world that I suffer with Binge Eating Disorder. These were some of my most popular posts last year. I truly believe that is because people may relate in some form or another, my hope is that they find strength in my struggles and admission to those struggles. In 2014 I took a much different stance on the holidays – I decided that I wouldn’t focus on the food only being around for one day and gorge myself. I decided to eat as if it were any other meal (and having a plan worked)!! 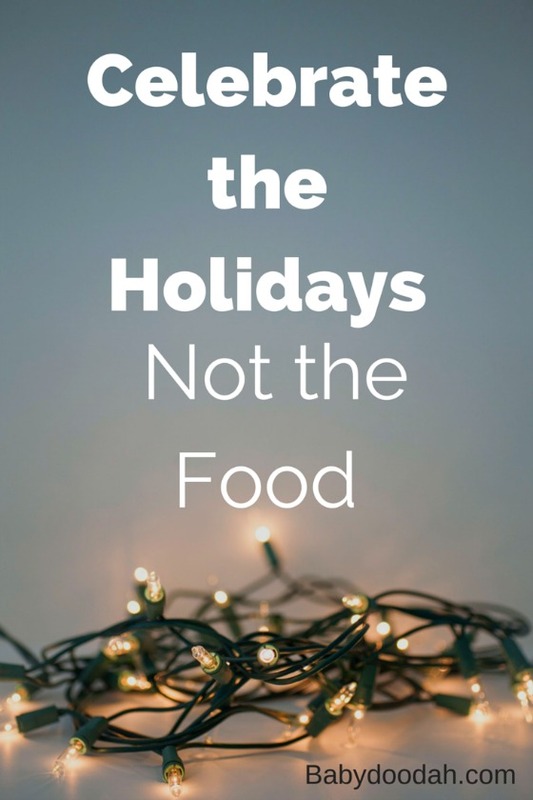 Celebrate the Holidays, Not the Food. Since I know all too well what it is like to suffer with Binge Eating Disorder or Emotional Eating, I wrote a post sharing signs that show you’re eating your emotions. My hope is that this post will help someone else recognize and overcome their struggle. I loved this post! I do believe that the reward system can be very motivating to many people. It was for me! We moved in 2014 (and will likely be moving again in 2015). 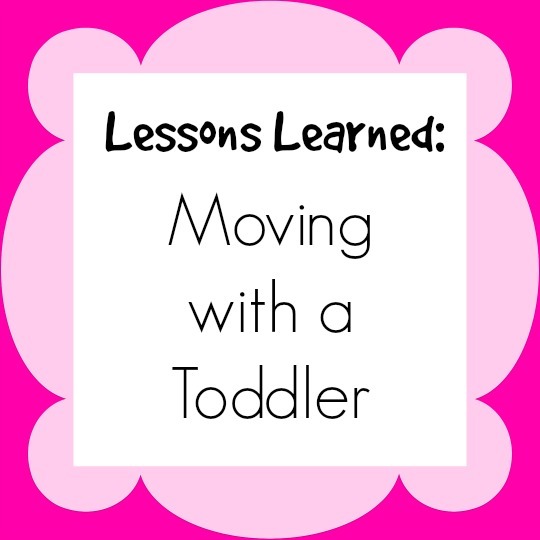 I took some time to write some tips and tricks to move with a toddler. I live in NY so our Winters can get pretty hairy, and driving in the snow is no easy feat! I decided to take some time to write out tips for Winter driving for parents. My husband makes the best guacamole – I’d bet on it!! I was such a good and kind blogger and shared his AMAZING and (easy) recipe. I guess I should really just say that my husband is an amazing cook! Here’s his (borrowed from his mom) meatloaf recipe– again it is so amazing! Obviously I think having a boy rocks! And, of course I had to write about it! Why I think having a little boy rocks! Do you use apps with your toddler? We only use specific ones, that have some sort of educational value. There particular apps were my favorite. 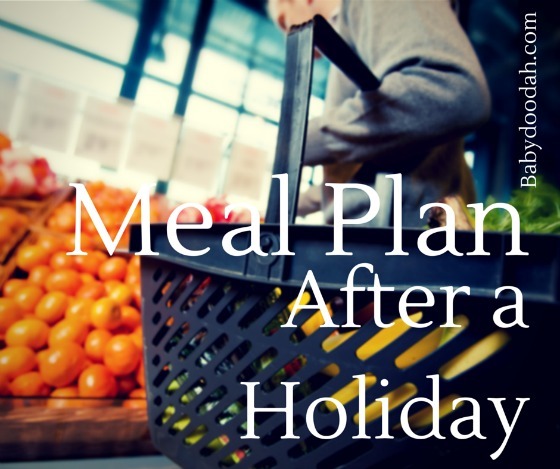 Need tips or motivation for making a meal plan? I wrote a post sharing my BEST tips for meal planning success. And finally, the elusive potty training habit. We haven’t gotten there, quite yet, but I believe Emmett is getting closer. Here’s what to look for to know when your child’s ready for potty training. We are always looking for bigger better ways at managing our time, I started my slow dive into becoming a master of time management with this post. The first few months of 2014 were some pretty tired ones for this house! We dealt with some serious toddler sleep regression. Those were my top posts for all of 2014. It was really fun to go through my archives and see everything I had written. Because, believe it or not, it’s easy to forget everything – especially when your life is so busy. Do you have a favorite post from the past year? I would love for you to share it in the comments below! I was going to start this post by saying that the holidays are on their way, but let’s be real, they’re here. Thanksgiving is 3 days away, and Christmas is 30 or so days away – they’re definitely here! This is a time of the year where people tend to let their bad habits come back into play and claim that they’ll start anew after the first of the year. I was typically one of those people, but I’m not this year. Nope! No way, no how! I thought since I’ve shared my journey with you, I’d take some time to explain how I plan on staying focused on my health this year. I would say, nearly every year since I can remember has been spent telling myself that it’s okay to OVER indulge and gain a little weight, because the first of the year is right around the corner, and what better time to restart the weightloss journey than January one? Am I right? This year, I decided to do something a little differently, technically A LOT differently for me. I plan on treating this time of the year the same way I do every other part of the year, when it comes to food. I’m not going to eat like it’s my last meal, or like I’ll never have the food again – I’m going to enjoy what I want, but in moderation. Usually I would agree, but something is different for me, this time around. The other day, while celebrating early Thanksgiving with my family, I didn’t feel the normal pull of 2nd and 3rd helpings. And, I was even asked if I wanted more squash/potatoes/cranberry sauce/turkey, but I said no to all of it. I was full, I knew it, and my belly knew it. Instead, I spent the precious time with my family all together, laughing and not focusing on the food on the table or going in my mouth. I imagine the experience was similar to how a naturally thin person would eat. I knew there was food in front of me, I knew I wanted to eat some of it, but I wasn’t concerned about the amount I’d eat. It was an amazing feeling!! I can’t really pinpoint exactly what has caused this change in mindset, but what I can share are the many different things I am doing to better myself, and have a healthier relationship with food. Started drinking Shakeology daily – I truly believe that this is a huge part of why my cravings are manageable. Stopped hating on myself constantly – I used to be so mean to myself, now, about 80% (I’m working on the other 20) of the time, I am kind and loving and am more accepting of my flaws. Started working out regularly – Any workout will really get you feeling better, but doing it regularly will change your entire mind. Actually listening to the complements that my husband gives me – Probably seems like an easy one, but it was actually pretty difficult. I just never saw what he did, I shut that part of me up and now listen to Seamus. Stopped worrying about whether I’ll ever have another Big Mac, slice of pizza, chicken fingers, etc., again – I tell myself that there will be another opportunity for these foods, but I have to really want them (except for the pizza, that I will splurge on, or make at home). See… I’ve made a lot of changes! But, let me make one thing very clear, I am not 100% perfect with any of these areas. I still struggle with food, but since admitting and becoming more aware of my triggers, my bingeing and bad relationship with food has gotten much much better. So yeah, I’m excited about this holiday season because it means lots of time with family, who I only see a few times a year. The food? Well, that’s just an added bonus!! Curious to know more about my poor relationship with food? 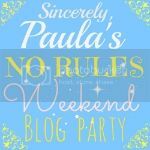 You can read all about my struggles with Binge Eating Disorder by clicking here. 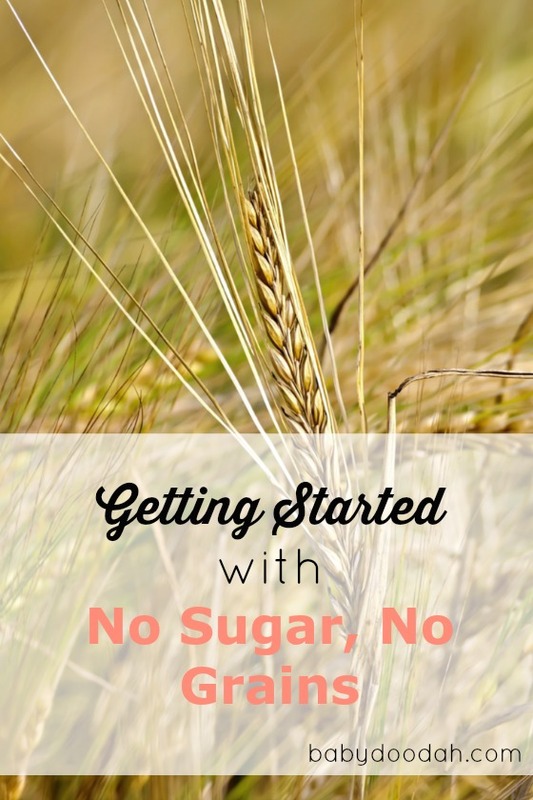 Have you made any changes in regards to your eating or relationship with food? Or are you waiting until the new year to get started? What’s your tried and true trick to help stave off the cravings? 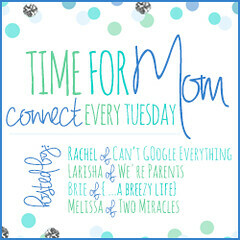 I’m linking up with Fitness Cheerleader and Running Rachel – YOU should join me at the #MotivateMeMonday link-up!